We are an established interior and architectural design studio creating exceptional residential and commercial interiors. Gabriel Bernardi is renowned for timeless and original interiors with an emphasis on detail and craftsman­ship, and his work is underpinned by meticulous research and extensive knowledge of classical and contemporary interior design and architect­ure. In addition to our personalised interior design service, Gabriel Bernardi also offers a complete design-and-build service to London clients through our own trusted construction team. Our showroom on Pimlico Road sources cutting-edge brands for your home. Whatever requirement you have in mind, get in touch as we'd love to discuss it with you. Our showroom at 59 Pimlico Road gives you access to discerning international brands like Puiforcat, St. Louis, Ercuis and Haviland porcelain. We offer a consultation service where we source selected products & accessories for your home, for weddings, or as gifts. We have proven experience in creating exceptional interiors for residential and commercial clients. Working with us, you will enjoy the befits of using a small, efficient and local team - underpinned by first-rate construction services and project management. 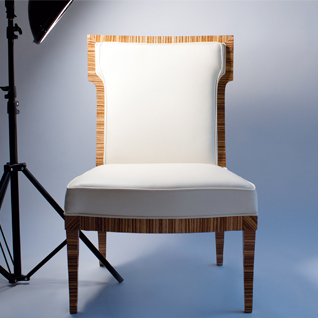 Whether you have a particular idea or style in mind, or whether you require a specific design solution, we can design and produce exceptional furniture to your exact requirements. We work closely with UK artisans and craftsmen to produce high quality, one-of-a-kind pieces. Described by Vogue Living editor Annemarie Kiely as "the last of the great larger-than-life designers”, John Coote, was one of the most influential and respected interior designers in Australia and a mentor to many in the Australian design community, forming a partnership with Gabriel to launch Coote & Bernardi in 2009. In over thirty years in the design business he completed many outstanding projects, from country estates and period townhouses, to corporate headquarters and several ocean-going yachts; though he was perhaps best known for his restoration of historic houses and newly built residences in the classical style. He was renowned for his extensive knowledge of design and architectural history which informs Gabriel Bernardi's work, with a focus on meticulous research and historical correctness. He enjoyed a close working partnership with Gabriel and is greatly missed.